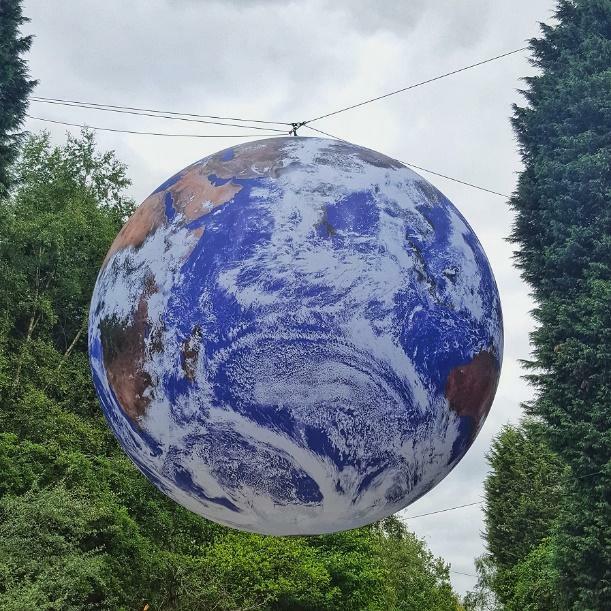 A group of Grantham Scholars went to the Bluedot festival to showcase how tracking our urban environment could lead to better, more sustainable cities. They took the MOBIUS (MOBIle Urban Sensing) van along with them, a mobile tracking vehicle manufactured by the Urban Flows Observatory, which takes all sorts of readings that increase our understanding of how cities work. Bluedot, an award-winning weekend of discovery at the grounds of the Jodrell Bank deep space observatory, brings together music, science, arts, culture and the exploration of space to inspire the scientists of the future. Attending this festival gave us Grantham Scholars the unique opportunity to reach out and engage with a demographically diverse audience. This year about 10,000 people attended the festival to see musicians, comedians and leading thinkers and scientists. Headlining bands included the Flaming Lips, Future Islands and the Chemical Brothers. Casetteboy and Rob Kemp were among the comedy offerings. For the science enthusiasts, there were talks throughout the weekend by Richard Dawkins, Jim Al-Khalili, Tim O’Brien, the Jodrell Bank scientists and our very own Professor Martin Mayfield from the University of Sheffield who was speaking on the future of cities. Close to a large model globe, the science and engineering exhibits were located at the Planet Field. Our team of Scholars consisting of Ling Min Tan, Jonathan Sykes and Saeed Wazed were joined by fellow PhD Said Munir, 4th year MEng student Qianqian Li who volunteered to assist us with the demonstrations. Last but not the least, we were supported by the Chief Technical Officer and the man behind the construction of the MOBIUS van, Steve Jubb. The event also gave us the opportunity to communicate with fellow exhibitors and organisers from University College London and the University of Manchester. The MOBIUS van was designed as a solution to use technology more efficiently. Monitoring systems can be very expensive and to get detailed environmental data of an area the cost can go well into the hundreds of thousands. Instead of placing such equipment across the city a more efficient solution would be to use less expensive equipment to scan the area. While the data from the less expensive equipment is also less accurate, it will be able to provide us with a general idea of where the problematic areas are in terms of pollution and energy losses. The van can then be driven to the problematic areas to get precise recordings. The van can also be used to validate environmental models that are created from the analysis of the data and calibration of other monitoring equipment. Presently the MOBIUS van is kitted with environment monitoring equipment such as air quality monitors, particulate monitoring systems, gas monitors and weather stations. The van is also equipped with a 9m long mast for air quality monitoring up to three storeys high. At the Bluedot festival we monitored gasses including carbon monoxide, ozone and nitrous oxides; particulate matter ranging from 1 micron to 10 microns; and weather including humidity, pressure, temperature, wind speed and rainfall. Gathering and displaying real time data throughout the day we were able to show how weather patterns and the surroundings affected the space around us. What really brought in the crowds at the festival was the prospective future of the van. This was the section where the public got a chance to interact with the equipment on the van, including thermal imaging cameras and virtual reality headsets. 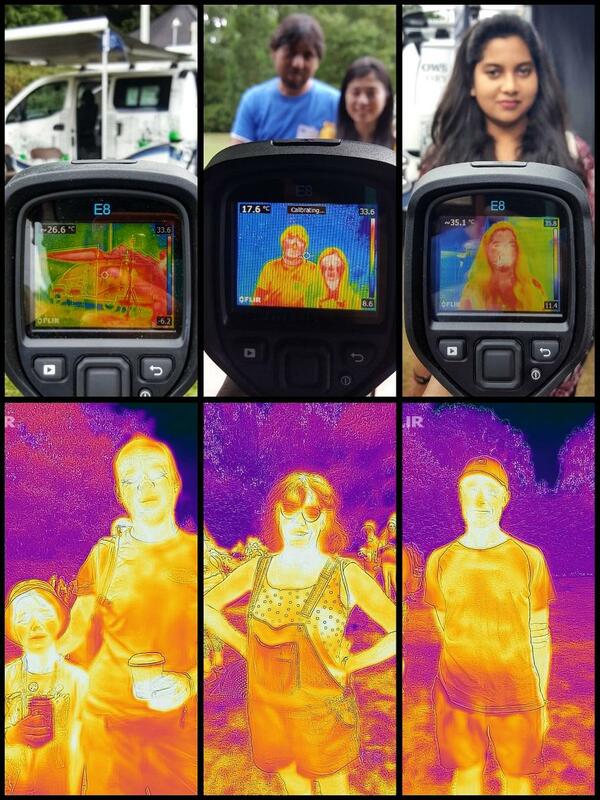 We showcased two types of thermal imaging devices, one standard handheld device with point and shoot thermal imaging capability and another one that can be plugged into hand held devices such as smartphones and tablets. The thermal imaging devices are used to detect flow of energy, such as insulation losses in buildings. In the future, the data obtained through thermal imaging and Lidar detection will be mapped onto Google maps (or similar applications) to obtain a virtual ‘real-time’ overview of an area. This can assist engineers, designers and city planners to make quick site surveys remotely and come up with solutions faster. The main message we tried to get across was that we must design cities so that people can live in them easily, and do not have to travel far to get to work, or to the shops, or to green spaces. And we need to do it in a manner cares for the environment. In order to do this, we need to gather large scale city wide data. The Urban Flow Observatory will gather this data and make it public so that scientists and organisations can analyse, critique each other’s analyses, and come to a consensus of the issues affecting our surrounding – and hopefully solutions too. Everyone worked hard throughout the 3 days of the Bluedot Festival, putting in 10 hour shifts every day and camping on site. So at the end we rewarded ourselves with some amazing churros and a day off for resting and recuperating. Looking back, we can say that the event was a great success. People in general really understood the importance of gathering data to improve our cities and lauded our efforts. With our interactive demonstrations we also garnered a lot of interest from the younger, tech savvy demographic – though in terms of impact we may have beaten by a bunch of chemical engineers making slime!